It’s tempting to think that all the great archaeological discoveries from ancient Egypt have already been made, but new research published today in Nature shows there’s still plenty for us to uncover. 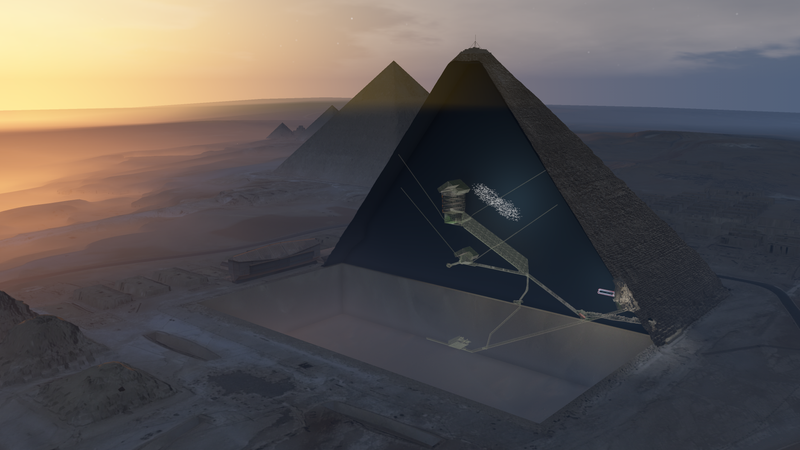 An investigation into the internal structure of Khufu’s pyramid—the largest pyramid in Giza—has revealed the presence of a large and inaccessible “void” within the structure. The researchers who led the study, Mehdi Tayoubi from the HIP Institute in France and Kunihiro Morishima from Nagoya University in Japan, won’t go so far as to say the cavity is a hidden chamber, but they’re reasonably convinced the internal feature is a deliberate architectural feature of the pyramid. As to what’s inside is anyone’s guess, but the presence of artifacts and funeral items are not out of the question, according to Egyptologists. The discovery was made possible through the unlikely intersection of archaeology and particle physics. By making meticulous measurements of muons—elementary particles that rain down on Earth from deep space and are capable of traveling through solid objects—researchers were able to characterize the densities within the pyramid, revealing the presence of an empty space that measures at least 100 feet (30 meters) in length. That Khufu’s pyramid may still hold a chamber waiting to be found is within the realm of possibility. This massive structure was built on the Giza Plateau during the Egyptian Fourth Dynasty (c. 2613 to 2494 BC) by the Pharaoh Khufu (sometimes referred to as Cheops), who reigned from 2509 to 2483 BC. The pyramid initially measured 481 feet (146 meters) in height, and was the tallest structure in the world for more than 3,800 years. There are three known rooms inside the monument: the King’s Chamber, the Queen’s Chamber, and an unfinished room cut into the bedrock upon which the pyramid was built. There’s also the Grand Gallery, a sloped hallway-like structure measuring 28 feet (8.6 meters) high, 153 feet (46.7 meters) long, and about 6 feet (2 meters) wide. The original entrance leading to these internal structures, known as the “descending corridor,” is located at the North Face, but today, tourists are allowed to enter the pyramid through a tunnel attributed to Caliph al-Ma’mun (around AD 820). Archaeologists don’t have the original blueprints to Khufu’s pyramid, and there’s no consensus on how the structure was created or what hidden features may still lie inside. The only known documents, written on papyri, only describe the logistics of the construction, such as how the stones were transported (fun fact: the Great Pyramid contains an estimated 2.3 million blocks). Detecting hidden chambers or corridors is not easy for archaeologists, who mustn’t damage ancient structures in any way. Egypt’s Supreme Council of Antiquities is very strict about what can and cannot be done to these historic monuments, requiring scientists to come up with innovative new ways of exploring the pyramids. Back in the 1960s, archaeologist Luis Alvarez came up with the idea of using muons—a type of elementary particle that’s capable of penetrating dense materials—to peer inside Khafre’s pyramid (the second largest of the Giza Pyramids). Unfortunately, his team lacked the technological and scientific know-how to pull it off, but Alvarez’s idea has proven its worth. Today, the technique, known as muography, has been used by archaeologists to analyze ancient Roman structures and Mexican pyramids, and by geologists to explore features such as volcanoes. Muography has also been used to assess damage at the beleaguered Fukushima nuclear power plant, and by the US military to find hidden caves and tunnels in Afghanistan. In terms of the physics involved, muon particles originate from the interactions of cosmic rays with the atoms in the upper atmosphere. They pepper the Earth at nearly the speed of light (they’re harmless to humans and other animal life), and researchers can visualize the presence and trajectory of these particles using various muon detection schemes. Muons are only partially absorbed by solid objects, and can thus penetrate stone. But by mapping the positions and trajectories if these particles, researchers can visualize the internal composition of solid structures—revealing things such as stone formations or open-air cavities. “Similar to X-rays which can penetrate the body and allow bone imaging, these elementary particles can keep a quasi-linear trajectory while going through hundreds of meters of stone before decaying or being absorbed,” write the researchers in the new study. Last year, the ScanPyramids project—the same team of researchers involved in this latest discovery—used muography and infrared thermography (which measures temperature) to uncover a corridor directly above the Great Pyramid’s original entrance. Using the same idea, the researchers have now discovered the large void located directly above the Grand Gallery. To validate the presence of the void, the researchers recruited specialists from three different institutions. Each team employed their own unique muon detection technique, and stationed their scanners both within and outside the pyramid. Researchers from Nagoya University used nuclear emulsion films to track the muons in three dimensions, a team from France’s Alternative Energies and Atomic Energy Commission (CEA) used scintillator hodoscopes (scintillating materials emit light when particles pass through it), and researchers from KEK High Energy Accelerator Research Organization did it using gas-based detectors. Because only one percent of muons reach the detectors, data must be meticulously accumulated over the course of several months (the exposures began in December 2015). All three teams reached the same conclusion—there’s a large, open cavity directly above the Great Gallery, and it’s about the same size and shape. The void is about 70 feet (21 meters) above ground level, and is at least 100 feet (30 meters) long, but the researchers aren’t sure of its inclination. During a press conference held yesterday, the researchers stubbornly refused to speculate. “We’re avoiding the word ‘chamber,’” said Mehdi Tayoubi. “We know that it’s a big void, but we’re not calling it a chamber.” The ScanPyramids scientists admitted they’re not experts in this area, and that specialists in Egyptian architecture should use this discovery as an invitation to join in and help explain the mysterious cavity. Importantly, the researchers were able to rule out “non-void” possibilities. Because small gaps or crevices cannot be detected using the muon technique (it can only detect wide open spaces), there’s virtually no way the space is a “swiss cheese” of stone, as some scientists have speculated. It’s also unlikely, the researchers say, that it’s just a sign of interior wear-and-tear, some kind of collapse or construction flaw in the design, or the juxtaposition of small and large stones. Importantly, the area in question produced the same muon data patterns as scans made of the Grand Gallery—a known “void” within the structure. Kathlyn M. Cooney, an Associate Professor of Ancient Egyptian Art & Architecture at the University of California Los Angeles, says it’s too early to speculate about the true nature of the void, but a hidden chamber is not an impossibility. Cooney, who wasn’t involved in the new study, said Khufu and his father Sneferu, unlike their Third Dynasty predecessors, began to “float” chambers within their pyramids. The obvious question at this stage is to ask what archaeologists plan on doing to find out more about this mysterious structure. During the press conference, the researchers said they’d like to perform more long term muon scans of the structure, and from different positions. This should allow them to create a more accurate picture of the space, and possibly find more hidden features. More radically, INRIA researcher Jean-Baptiste Mouret, a member of the ScanPyramids team, is currently designing an innovative robot that will be capable of squirming through a very small hole, and possibly fly like an aerial drone once it’s within the cavity (welcome to archaeology in the 21st century). Unfortunately, the void is located in a very difficult place to access, and some drilling may be required. This prospect could be minimized should the researchers discover hidden adjoining corridors. Take the recently discovered corridor above the original entrance; this passageway could contain a tunnel all the way to the void in a mirror image of the structures below it. But as Cooney explained to Gizmodo, the researchers will still have to get past the Egyptian antiquities ministry. “When you claim something like this, and even when you’ve got great science behind you, the Egyptians still have control over their national patrimony,” she said. “Ultimately, it’ll be up to them as to how they’ll want [the pyramid] investigated and analyzed as the archaeologists move forward.” She also says that outside researchers (which is the case here) will have to work with an Egyptian team, and work within the convoluted Egyptian political process. Lastly, Cooney made a plea to both the press and the public to remain patient.